Much can be seen in the field around Grinton Smelt Mill. 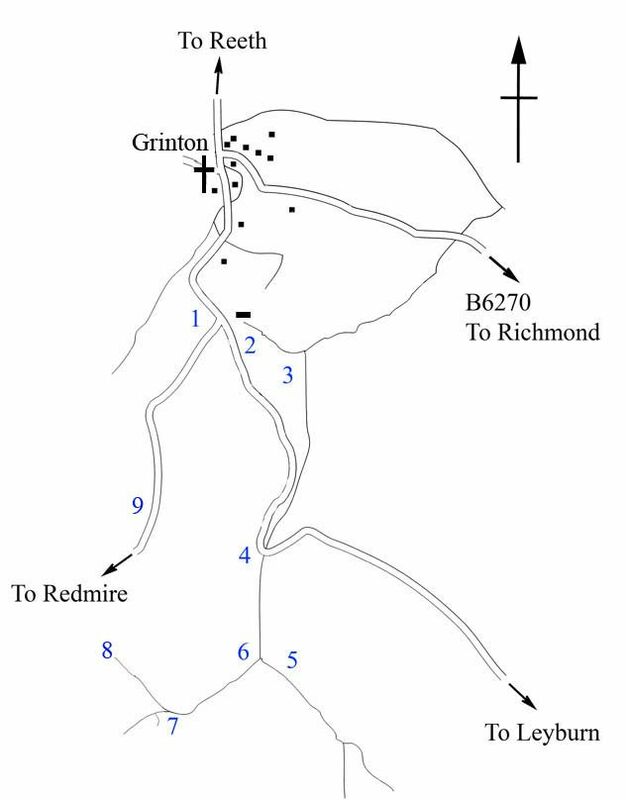 The following is a short (4km) walk that takes in the Smelt Mill and buildings and also the nearest hush and level entrances. The numbers refer to the map pictured below. Important Safety Note: This is mostly on good tracks but there are some steep and slippery sections. The hushes are full of spoil heaps which may yield some galena if you look hard enough, but they can be a bit unstable underfoot. Under no circumstances should levels be entered due to potential internal shafts and unstable stone work. Park in the small parking area at the road junction. Cross the road and follow the path keeping the barn on your left. Follow the wall and stream until you come to a wooden fence and style on the right. Cross the style and follow Cogden Beck south. Note the level entrance on the left. This was not a mining level but built purely for drainage for the other mine workings. When you come to the road bridge exit the beckside path up the hill and cross the road, beside the bridge rejoin the path and follow the beck again. The smelt mill comes into view. Retrace your steps a little and then turn SW (left) into a valley and onto an obvious track. As you make your way along the beck you will need to cross a number of times to avoid boggy ground. Notice the spoil waste lying on the ground. As you approach 7 you will see large spoil heaps (on the video) loom up in front of you. Go to the right of the spoil heaps and shortly you come to the level entrance. Follow the obvious track into open moorland and within 200-300m you will meet the road. Turn right to return to the starting point.